Friday Friends meets weekly from 2.00 – 4.00pm every Friday, price £3.50 (carers free), offering a mix of light exercise, singing together, tabletop games and craft activities in a safe, warm and friendly environment – with tea and cakes. 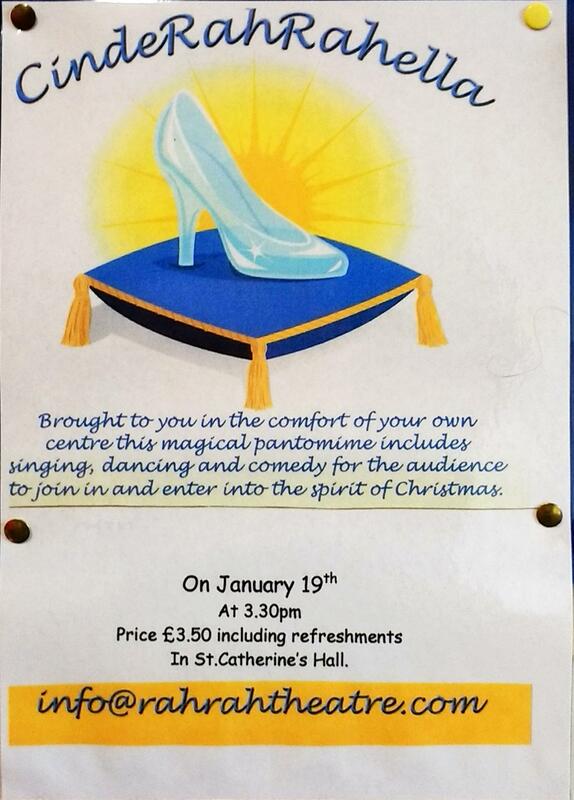 On 19th January, the Rah Rah Theatre will be visiting Friday Friends, at St Catherine’s, to present their pantomime – “CindeRahRahella”. Click here for further details of the production. Friday Friends starts a littler later than normal that week at 2:30pm, but you can still arrive early for lunch in the Café. The Café opens at 10:00am, with the lunch menu starting at 12noon. Christmas is over, the children are back at school and life is ‘back to normal’ after the long break. However, for many people there is still a feeling of ‘A New Start’ in the air. We’ll be exploring that feeling at Messy Church this Saturday where we’ll be looking at the story of Noah and the new start which those events brought. To help the story, we encourage young and old alike to bring along a soft toy animal ! We hope to see you at St Catherine’s, on Saturday 6th January, starting at 3:30pm.